The fruit for Kilikanoon wines is mostly sourced from low yielding vines grown at the estate's vineyards in the Clare and Watervale regions. The now famous Killerman's Run is Kilikanoon's entry level Shiraz, which alone makes it better than many winery's premium offerings! 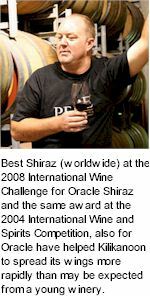 It is blended from Clare, McLaren Vale and Barossa vineyards, and combines the best of each of these. It is soft, juicy, ripe, and neatly oaked. Its aromatic, spicy, plummy and chocolatey. Its long, clean, balanced and succulent. The Kilikanoon group owns or controls over 500 hectares of prime vineyards throughout South Australia. They have chosen their terroir carefully to enable a wide range of wines which seek to express the individuality of their respective regions. All the Kilikanoon fruit is hand pruned and hand picked from vines that are 30 to 40 years of age. Traditional methods of vinification are used, fermentation taking place in small open fermenters and gently processed through a basket press. Kevin Mitchell has succeeded in putting some Clare Grenache to perfect use with the Prodigal, building a wine that has plenty of fresh berry fruit – raspberry, dark cherry, strawberry – wrapped up in the classic rosy sheen expected of the variety. It's a textural thing, almost like polished silk, found in the best Cotes du Rhones. Then there's a firm finish with tannins like a cup of fine black tea. The first Eden Valley wine in the Kilikanoon portfolio was sourced entirely from the Blacket Estate Vineyard located high up in the Eden ranges. Seasons in the Eden Valley tend to be Mediterranean in classification with winter to spring rainfall and long cool growing seasons. Grapes are harvested when the optimum balance of flavours, acid and sugar levels are at their peak. Gently passed through a membrane press with only free run juice making up the final blend, the wines are fermented cool to preserve the natural fruit flavours and aromas. In its relatively short history Kilikanoon has won a large number of Australian and International awards and received high praise from the world’s most respected wine writers. The 2002 Clare Valley Wine Show was what really put Kilikanoon on the map. Initially most of Kilikanoon’s red wines were crushed and fermented at Torbreck in the Barossa. Mitchell has also worked closely with Neil Paulett in the Clare Valley where the Kilikanoon Rieslings are crushed. Another important partnership for Kilikanoon has been with Rolf Binder in the Barossa, with whom Mitchell has formed the Binder Mitchell brand. In 2005, Kevin was finally able to realise his dream of building a purpose built winery with open fermenters and basket presses to ensure ever higher standards of quality from the expanding fruit sources. 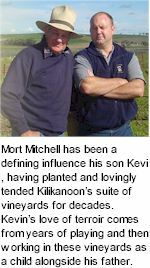 Kevin's father Mort has been a defining influence, having planted and lovingly tended for decades Kilikanoon’s Golden Hillside suite of contiguous vineyards, including the famed Mort’s Block, home to Kilikanoon flagship wines like Oracle Shiraz and Mort’s Block Riesling. The vines are now classified old vines, being around 40 year of age. Kevin’s love of terroir comes from years of playing and then working in these vineyards as a child alongside his father. In 2007 Kilikanoon, along with partners Janet Holmes à Court and Greg and Kerrie Paramor acquired Seppeltsfield in the Barossa Valley, one of Australia’s most revered and historic wineries. Established in 1851 and the home to one of the world’s finest collections of barrel-aged fortified wines, it houses a unique unbroken collection of Vintage Para Tawny (port) dating back to 1878, when the first wines were laid down, with the intention to be aged a hundred years. The next century looks to be just as exciting.